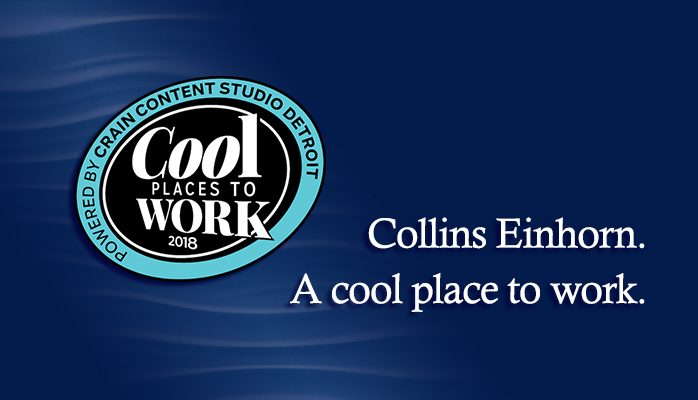 Collins Einhorn Farrell PC, a leading defense litigation firm based in Southfield, Michigan, is pleased to announce that it has been honored as a 2018 Cool Places to Work in Michigan by Crain’s Detroit Business. The Cool Places to Work in Michigan program was designed to identify, recognize and honor the best places of employment in Michigan, benefiting the state’s economy, its workforce and businesses. It recognizes companies that, according to their employees, go above and beyond in putting a focus on workplace culture. The 2018 Cool Places to Work in Michigan list is comprised of 100 companies in three size categories: small (15-49 U.S. employees), medium (50-249 U.S. employees) and large (250+ U.S. employees). Collins Einhorn was ranked 30th for mid-sized companies, and 65th overall. Collins Einhorn is proud to continue the tradition of placing priority on satisfied employees. Some employee “extras” include half-day Fridays during the summer, full coverage of employees’ and dependents’ health insurance premiums, monthly company luncheons, holiday parties, drawings for sporting event tickets and airline tickets, and other perks.